Today I did another Dirty Shirt presentation. I'm referring to it as the "last one" of the Dirty Shirt road tour, but that is probably a bad label. I call it that because it is the last one that I have on the docket for the immediate future. It's not to say I will not do another one, because I am almost certain I will - probably sooner than later. It's just that there is nothing scheduled yet and I am not actively seeking more. The thing is, I will take whatever comes my way and give it proper consideration. The book doesn't go away just because no one has called lately about a presentation. If someone called tomorrow and offered an audience, I'd probably jump at the chance. The whole Dirty Shirt travelling road show has been a surreal experience. I've slogged a million miles over these 21 months and wouldn't trade one minute of any of it. I've met some fantastic people - people in love with everything the BWCA stands for - and for that I am eternally grateful. People have been extraordinarily kind with their words and a few made it a point to contact me after they'd finished the book to tell me what they thought. I couldn't script a better tour. These last few appearances have been some of my best - in my opinion - and it's too bad that just when you get something working good, it ends. A few points about the crowd to at Clement Manor. As far as numbers go, there were as many people there as any presentation since my opening at Cafe de Arts. Clement Manor is an assisted living complex and part of their programming is their "Life Enrichment Center." The center holds classes and a monthly "Author Spotlight" feature which is what I fell under. To be honest, when I heard of the venue, I was trepidatious about the turnout. To my surprise I got an email saying there were 45 people registered! Even if it wasn't my finest presentation, it would be great to get in front of that many people and get them exposed to the book. I would guess the audience numbered around 40ish and they were one of the best. They were engaged, vocal (laughed when I hoped they would) and they asked great questions. 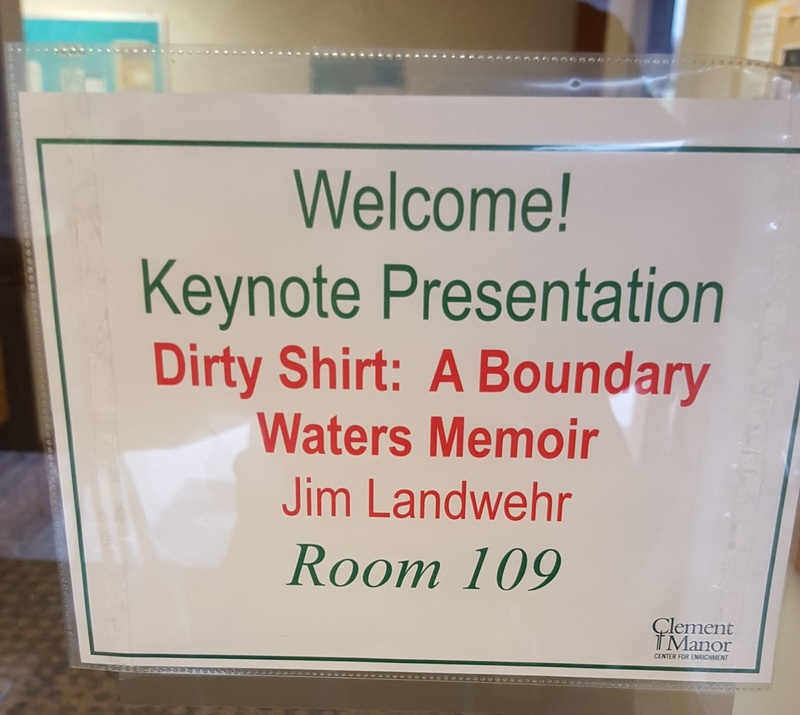 Some shared stories of their experience others asked why the name "Dirty Shirt?" Afterwards, they lingered, talked and bought books. A few thanked me and mentioned how they enjoyed it. Humbling feedback for a guy uncomfortable in his own skin, especially in front of a crowd. I take it as a sign that I'm getting better at this public speaking schtick and am going to run with that. My wife came and said it might have been my best presentation yet. God bless her for sitting through the same punch lines this many times. She could probably give my talk as well as me, head net and all. To be truthful, seeing her in the back of the room makes me more comfortable. I can't wait to see where the next book will take the two of us. Now all I have to do is write it. Until then, I'm sticking with the tag line: "Have book. Will present for food."